Crawley Athletic Club has "Track & Field", "Indoor", "Cross Country" and "Road Race" teams providing year round competition for all our members - male and female, young and old. As an affiliated club, to both Sussex County Athletics Association and the South of England Amateur Athletics Association (and through this to UK Athletics), Crawley AC can compete in local, regional and national leagues, due to its geographical location, Crawley AC is also affiliated to Surrey County AA. We also enter teams for many open events where any club can participate. Club vests are a requirement for all League and Championship events. These are available from the club during most training nights. The track & Field season commences in April and finishes at the beginning of September. Dates and venues of league matches can be found in the summer fixture list. If further information is needed then you should contact the relevant team manager, either on club nights or on the phone numbers shown. The British Athletics League (BAL) is a National league competition for senior men. The top 38 Athletic clubs in Britain compete in the BALs four Divisions. Crawley AC men's A team won promotion to the British Athletics League in 1984. There are 8 clubs in the Premiership Division and 8 clubs in National Divisions 1 to 3. National Division 4 has 6 clubs. The league contest is decided by the total number of league points gained in the 4 fixtures throughout the season. 8 points are awarded to the winners of each match, 7 points to second, and so on, with the eighth team getting 1 point. At the end of the session the top two teams in each division are promoted, while the bottom two teams are relegated. In the bottom division (National 4) the bottom 2 teams go into a playoff with the top teams in the regional leagues ie Northern, Midland and Southern Mens Leagues. The UK Womens Athletic League (UKWAL) is a National league competition for senior women. Crawley AC women\'s A team won promotion to the UK Womens Athletic League in 2010. There are 8 clubs in the Premiership Division and 8 clubs in National Divisions 1 to 3. The league contest is decided by the total number of league points gained in the 3 fixtures throughout the season. At the end of the session the top two teams in each division are promoted, while the bottom two teams are relegated. In the bottom division (National 3) the bottom 2 teams go into a playoff with the top teams in the regional leagues ie Northern, Midland and Southern womens Leagues. The Southern Athletics League (SAL) is for joint mens and womens team and covers the South of England (SEAA) region. The SAL has 5 Divisions including Div 1, Div 2 North, Div 2 South, Div 3 North and Div 3 South. Each division consists of 16 teams. Crawley entered the league in Div 3 South in 2013 won the division and in 2014 won Div 2 South and promotion to Division 1. The Youth Development League replaced the Young Athletes League and National Junior League, it is divided into two age groups; u13/u15 and u17/u20, both of which have their own matches on different days, mostly also different weekends. The league is also divided into areas, the Southern area consists of two premier divisions (1 and 2) and two regional divisions 1 & 2. The league is scored on league points. There is a promotion and relegation system. In the Premier 1 Division the top 3 teams qualify for the final and will compete against the top teams in the North, Midlands, Scotland and Northern Ireland. In Addition an Auxiliary final is available for 4th & 5th spot teams to again compete against the 4th & 5th top teams in the other areas. The bottom teams in the premier division are relegated into division 1. In Division 1&2 the top two teams in each division are promoted whilst the five bottom teams in division 1 are relegated. The Sussex U13 and U15 League is divided into two areas, East division and West division. Both divisions have 3 matches per season with a final match combining the two divisions. The league is scored on league points. The league consists of boys and girls teams. As well as team competition the individual athlete may enter Championship events at County, Area (Southern) or National level. In addition many young athletes represent their schools in the Sussex (or Surrey) Schools area Championships. Successful young athletes also go on to represent their county in the English Schools Championships. There are many open meetings throughout the year which are listed on the track fixture list. Details of these open meetings are often available from the club notice board on club nights. The indoor season commences at the beginning of October and finishes at the end of March. For those young athletes not into cross country competition can also be found in the Sussex Sportshall League. We enter teams of boys and girls under 15 years of age into this indoor athletic league. Successful athletes are selected to represent the county. The Sussex Sportshall league has 4 competitions consisting of 6 Sussex clubs. Dates and venues of league matches can be found in the winter fixture list. If further information is needed then you should contact the relevant team manager either on club nights or on the phone numbers shown. The cross country season commences at the end of September and finishes at the end of April. The cross country events range over a number of distances depending upon the age group. For example the young athletes U13 run a maximum of 2 miles, U15 a maximum of 2.5 miles, U17 a maximum of 4 miles. The Senior women cover a maximum of 6 miles whilst the Senior men run a maximum of 9 miles. Crawley AC has a very strong cross country section in all age groups of both men and women. Dates and venues of league matches can be found in the winter fixture list. If further information is needed then you should contact the relevant team manager, either on club nights or on the phone numbers shown. The Sussex XC League consists of four races per season with 16 Sussex clubs competing. For individual awards the best three races will count. Individual medals will be awarded to the first three in all age groups including all three veteran age categories for both male and female. Team awards for all age groups will be based on all four league races. All juniors U13, U15 and U17 Boys and Girls will be three to score. There will be two divisions for Senior Women (inc U20 and Vets). Division 1 (four to score) comprises of 8 teams, Division 2 (three to score) has all other teams. The Senior men has three divisions, Division 1 (six to score) comprises of 8 teams, Division 2 (four to score) has 8 teams whilst Division 3 (four to score) consists of all other teams. The veteran mens league has one Division (three to score). The veterans will be allowed to score for both Senior and Veteran teams. As well as league competition the team also competes in a number of Championship events at County, Intermediate Area (South of Thames), Area (Southern) or National level in all age groups. In addition many young athletes represent their schools in the Sussex (or Surrey) Schools area Championships. Successful young athletes also go on to represent their county in the English Schools Championships. In addition successful club athletes in all age groups will also go on to represent their county in National inter county competitions. Every New Year's Day the club holds it's cross country championships for the Tom Lintern Trophy. This fun event is run on a handicap basis with the slowest runner setting off first. The road running season is all year round. Road racing is mainly an individual affair, however there are several events, including relays in which both individuals and teams compete. A large number of club members compete in the road races across the season ranging from 5ks, 10ks, half marathons and marathons. Several club members compete in the London marathon each year. In addition the club has a proud history of "Ultra" running within the country. The Crawley team has been particularly successful in the London to Brighton race. Sadly 2005 was the final year for this event due to the increasing problems with traffic safety. We also enter teams in the Sussex and Southern Road Relay Championships. 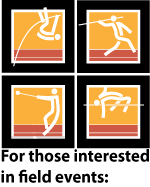 The relay team events are arranged by the relevant cross country team manager. The club also holds a number of road races across the winter season including the Ifield 5 mile and 10 mile road races which are held on a flat fast course. These events are run on a handicap basis with the slowest runner setting off first followed by the quicker runners on a staggered start time basis.